For the longtest time, Cablevision’s Optimum was the only game in town when it came to TV, and high speed internet, then FiOS arrived and seems to be giving Cablevision a run for their money, literally. We switched to FiOS shortly before buying our house last December, and it was an entertainment upgrade in nearly every regard. The picture quality was noticeably better, and the tuner/receiver was far more advanced. Optimum’s internet download speeds (with ‘boost’) typically varied between 20 and 30 Mb/s and around 5Mb/s upload, FiOS was able to give me a solid 25/25 Mb connection. A few weeks ago, a charismatic young man from Cablevision rang our bell, and had some compelling arguments for switching back, so we invited him inside. He took a look at our Verizon bill and claimed he could provide the same service for less money, port our number from Vonage, install extra lines upstairs, and in the office and even pay the termination charge from Verizon all without any contract agreement. It would be around $50/month less, for pretty much the same thing. Sure, why not? We don’t watch a whole lot of television, or make many phone calls and there’s isn’t a whole lot different when it comes to internet service. A few weeks later, the Cablevison installer comes to the house and connects the modem next to the TV, so Saturday afternoon I reconnected it into the new line he ran in the office. Sunday afternoon, both televisions stopped working. Tess calls Cablevision and they tell her that there ‘might’ an outage in the area, but she should try connecting the component cables instead of the HDMI cables and call back. Doesn’t work. I call next time and they do some kind of diagnostics and inform me that the signal strength to the box is too low, and they’ll have a service person come by before 8p that night. Great, alright. After waiting around until 8p, and not hearing anything from Cablevision, we call tofind out what’s going on. Cablevision claims that we had canceled the repair call earlier that afternoon, which was flat-out wrong. I’m pretty sure we’re switching back to FiOS as soon as we can, even if there’s a $360 termination fee. So I’ve always toyed with the idea of a writing a blog, like every other person on the internet (even Brady has one). So I figured it’s about time, and my first post would be about one of the most important days of my life, the birth of my son Sebastian. February 14th, 2010, Sebastian’s estimated due date. Tess and I went for a walk at the boardwalk in Long Beach, secretly hoping the ocean air might entice him to join us. Nothing. The next day we were at the OB for a checkup. No Dilation, no contractions. They monitored his heart rate and checked him out via sonogram, and everything seemed ok, so we continued to wait. A few days later, I get a call from Tess, the OB is going to induce labor because the baby is so big, and he’s past due! I rush home we get ready and head to the hospital later that evening. I was an absolute nervous wreck, but I tried not to show it. 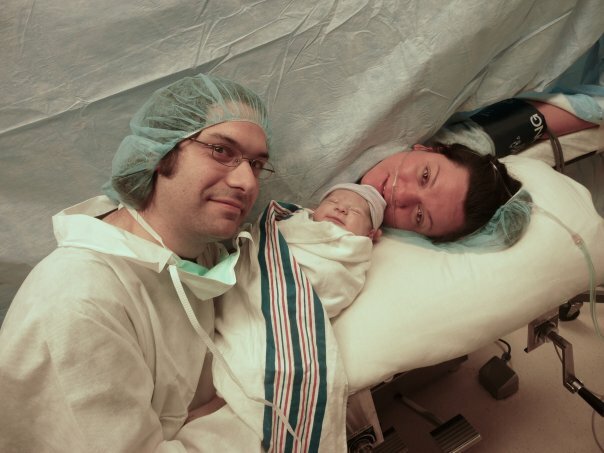 Inducing labor was all about waiting, and 24 hours later, the doctor finally said she’s going to perform a C-Section. 9:30p we were prepped and in the operating room. I held Tess’s hand while they doctors did their thing. We heard our son’s voice for the first time at 10p, Tess and I looked at each other with wide teary eyes, and not a minute later I was holding the new addition to our family.